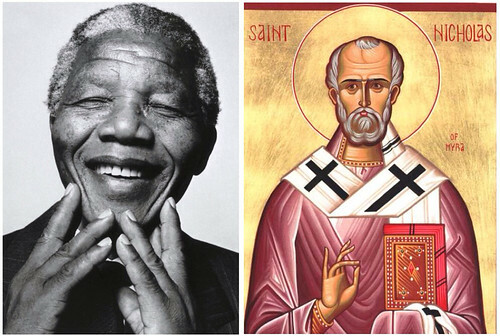 I was dreaming up a blogpost on the legends and myths of St. Nicholas when I heard the news of the death of Nelson Mandela. I was eager to write a few reflections titled, "Santa's Real: The Man Behind the Myth," when I learned of the South African freedom fighter's passing from this life into life eternal. Mandela's long walk to freedom had finally reached the end. 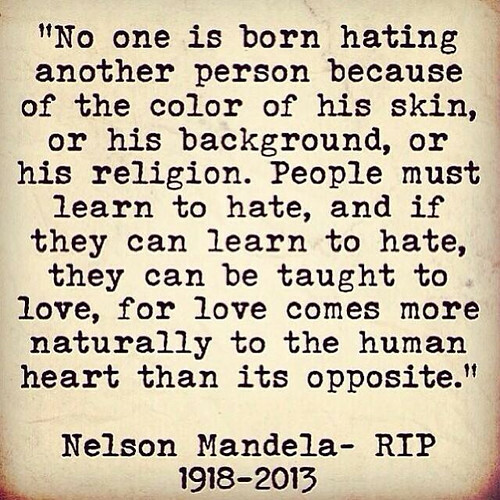 Better said, Mandela entered God's great liberation that will one day behold us all. I am no Mandela scholar. I am a novice when it comes to the history of South Africa and the struggles with apartheid. I was ten when he took office and vaguely remember watching his inaugural address on t.v. in history class. While his autobiography, A Long Road to Freedom, is at the top of my list of all time favorites, I would have to google quotes for this post. But we don't need the writings of a saint, letters of a hero, or verbatims of revolutionaries in order to be moved and shaped by their legacy. Their lives and witness take on a spirit of their own, influencing generation after generation to live into the same ethics and virtues of these icons of faith, justice, and commitment to the common good. So as I sit hear drinking my coffee on December 6th, a date marked for the Feast of St. Nicholas, I find it fitting to do so with a streaming of tributes to Mandela in the background. Afterall, the fourth-century bishop of Myra and our generation's greatest patron to justice and reconciliation hold much in common. There are stories of St. Nick secretly liberating three young women from being sold into prostitution by their father, who was on the brink of poverty. Tossing bags of currency through down chimneys and windows, which landed in the middle of dinner tables and even a sock hung up to dry, St. Nick looked for secret and subtle means to set captives free. He was, in a way, one of the earliest advocates against human trafficking. While Mandela was the oppressed fighting for liberation, St. Nick used his privilege to do the same. St. Nick, who came from a wealthy family, leveraged his status and protested corrupt empires, politicked against unjust taxation, interrupted the executions of the innocent, struck down oppressive idolatry, and advocated for children near and far. The saint who would be co-opted by Coca-Cola commercialization and mutated into Santa Claus, was more than jolly. Nicholas of Myra was a religious and social revolutionary who was fueled by far more than milk and cookies. And like Mandela, Nicholas spent time in prison. It seems most advocates of God's dreams for the world do. I have to get me a record. People have often asked if Amber and I are going to play Santa Claus with our kids. We want our kids more versed in the legends and praxis of St. Nick than the over-commercialized icon of materialism. We don't want the revolution to die. And when I consider that my kids will never see Mandela live on t.v., I want to make sure they learn stories of this twentieth and twenty-first century saint, too. So we are going to have to tell them all kinds of stories. We are going to have to embrace a variety of traditions and maybe craft a few of our own. If we want the revolution of love, justice, and peace to be embraced by our children, we must tell the tales and leverage the legacies of heroes and sheroes of the faith. There are plenty of tales and legends to tell. And by the way, Mandela Day is July 18th.